Hello fans! It's a new year and a new decade (if you start counting from zero). 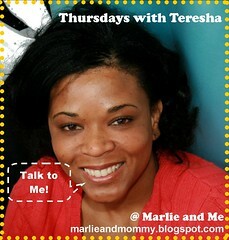 Today on Thursdays With Teresha, I will be looking into the future...and making plans to enjoy some of this year's entertainment offerings! What are some things you want to accomplish in 2010, what about in the next 10 years? I shied away from making any resolutions and made a list of personal goals instead...like finishing the children's book I'm working on. I can't even think about ten years from now...one day at a time. What do you do to stay motivated and on track toward achieving your goals? I have my list of goals stuck to my computer on a post-it to remind me to never give up on them. What was the last adult book you read? I can't remember the last adult book I read...sad, I know. How do you carve out time for yourself and your husband? I learned that I have to be intentional about making time for me and my marriage whereas there used to be a lot more spontaneity. For example, scheduled a movie nights are a must. Otherwise movies will sit on top of the DVD player for months. Do you use Netflix, redbox, Blockbuster or Movies on Demand? Netflix! I love the convenience of having movies delivered by mail or being able to watch instantly with our Roku box. We also use redbox occasionally. Speaking of movies, what films are you excited to see this year? I am most looking forward to seeing the first part of the final Harry Potter film this Thanksgiving. Is there a television show premiere that you are looking forward to? I am eagerly anticipating the return of LOST. Will you be watching American Idol this season? Do you think it will be better or worse without Paula? I will be checking out American Idol because I'm curious to see if it loses its mojo. If you could be a participant on any reality show, which would you go on and tell me why? I would love to compete on American Idol for the wardrobe and hairstyles, but I can't sing. Will you be watching the college football championship game tonight, and who are your rooting for? I am boycotting the Bowl Games since my alma mater (the Gators) are not playing in for the championship. I would totally go on Survivor! that's ditto for number one! wondering...im not linked here? not even one of my four where you are linked =( may i be? Yes, I'm excited to see what you have in store next. We're going to watch American Idol this season because my son wants to. I used to really enjoy it but I did not watch last season for some reason. Another LOST fan! I have been waiting for the new season since last year. I would love to be on the Amazing Race. How exciting that your working on a children's book!